I’ve done a bunch of webinars, but this broke all of my records. Both the non geek HTTPS site conversion for site owners and the Site Conversion for Designers were the highest webinar registration I’ve ever had. We covered why you don’t want to use plugins and quick conversion methods and all the trouble you will have with those. Plus, how to understand, and more importantly, vet all the info you’re getting about it. And everyone was thrilled to get my Ultimate HTTPS Pre Conversion Checklist. That is going to make the whole process way easier for both the site owner and webmaster doing the conversion. My email inbox blew up for days after these webinars. Site owners, you need to get on someone’s list to help you with your site conversion asap. I’m already booked solid until March. And I doubt that anyone who can do conversions is going to be any different for the rest of the year. I want to thank my site audit clients who empathized with the overwhelm of response from the webinar. Y’all are so sweet to say you could wait, if need be. 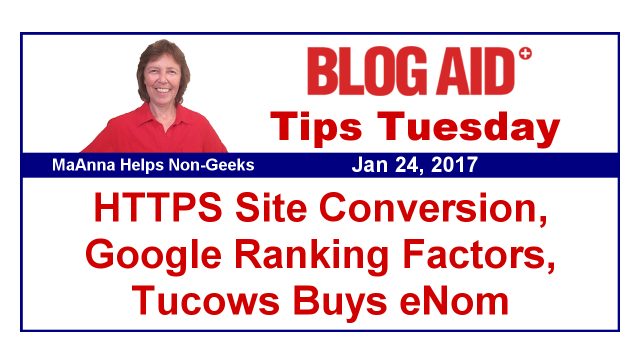 But, I want to let everyone know that my site audit clients are at the top of the list for site conversion for several reasons. You already have most all the info in that pre conversion checklist ready to go. Your sites are all nice and clean because we put them that way and you’re educated on how to keep them that way. Those conversions are going to be easier, faster, and cheaper because you have already invested in your site success. And this is where that investment really pays off. Prior to the webinars, I was already working with a few clients who had been hands off site owners. Their sites were hacked or they had other serious issues. Gathering up all of their site info has been a real chore. And one of those sites has so many issues that it is not even cost effective to save it. We’re starting over. Those are bag of cats projects. Don’t let this be you!!! Get a site audit and get all that stuff cleaned up before you request a conversion. I told you so!!! Converting sites to HTTPS is the hottest, most in-demand skill for designers and webmasters in 2017. And my inbox after these webinars proves it. If you’re a webmaster or a designer, you MUST get up to speed on securing sites and converting them to HTTPS. You don’t have to convince site owners why this needs to be done. They are ready to make the switch. And if you don’t provide that service, they will find someone else who will. Plus, if you’re not building all new sites on a secure foundation and on HTTPS, you’re going to be out of business next year. So, it’s either learn how to do this stuff, or find a trusted partner you can outsource it to. This testimonial from webmaster Pam Saxon of Saxon Creative made my day. She posted it in our private Facebook group for Webmasters. I’m still in the process of finishing up all the changes to both of my member sites. Those are priority 1 for me this week. I hope to have an email out to all members by the weekend or first of next week with all of the changes, so look for that. SiteGround is blazing a trail for all other hosts to follow. They will auto issue a free Let’s Encrypt SSL certificate for all new domains and hosting packages. This is one step forward in a bigger process to make a 1-click install of SSL for all site owners on their host. And, they are going to try to give you easy ways to do the actual conversion too. As folks in my webinars saw, that is so not the way you want to go with it. This is the equivalent of the 1-click WordPress installation. There’s nothing secure about it. Just ask any of my site audit clients about the huge difference in site security, that also radically affected their performance. WPTavern also mentioned this move by SiteGround and gave their $.02 about it. Just know that other hosts will be following suit on this. This also explains what I’ve been seeing in site audits. There are now two listings in AWStats for every domain – the SSL version and the original. I’m having a hard time accepting the findings in a recent report of the new Google ranking factors. The study was conducted by SearchMetrics, which is a very reputable SEO service provider. And here’s the link to download the full report, if you want it. The link I’m highlighting in the title of this section is to Search Engine Land’s breakdown of the report, which is a little easier to digest. What is important is relevance. That means, search is getting more personal. The other reason I hope you’ll see the article on Search Engine Land is because they also mention another report by the nice folks at Stone Temple Consulting, which states backlinks are still very important. I trust Eric Enge at Stone Temple Consulting because he does his homework, lots of it. And his past predictions about what Google’s up to and new trends has been spot on. So, when Eric says backlinks have always mattered and still will, I have a hard time accepting anyone who says they don’t. So, if these two entities are coming up with different data and different conclusions, it makes me wonder if they were both testing the same types of sites. You’ll want to read both articles yourself and see what you think about the types of sites they tested and their conclusions. Elvis has left the building y’all. It’s official. Matt Cutts, the public mouthpiece, er lighting rod, of Google has officially resigned his post after a long hiatus from his former spokesperson position. John Mueller took over and holds weekly live discussions for webmasters. Matt is now working for the Pentagon’s Digital Defense Service, making the web a safer place for all of us. You know when you visit a site and get a 404 page not found or a 500 internal server errors? Well, those are HTTP status codes. And they impact your SEO too because Googlebots get them as well when they try to crawl your site pages. Team Yoast has a nice post on them and what they mean for your SEO. Now, I do want to speak to the difference in 404s and 410s that he mentions. In Google Search Console, you can mark deleted posts and pages as 410 to tell Google they really are gone. But John Mueller once said that Google treats them about the same and it’s not worth making the effort to mark 410s. Google will eventually figure it out and drop the page or post from indexing. But, he also said, and Yoast does too, that a bunch of 404s tell Google, and maybe even your readers, that you have problems on your site. And that will impact your SEO and your traffic. So it’s a good idea to take care of them one way or the other. If you can, redirect them to similar content. But definitely don’t redirect them all to your home page. That shocks both Googlebots and readers because they don’t know why they ended up on a page that is not the content they were looking for. And Google will eventually pop you for that as well. I’m hoping to bring you interviews with SEO experts about deleting posts and your SEO, but scheduling has been an issue since before the holidays. I’ll keep you posted on when we do get those interviews setup, though. Oh man, the domain provider Tucows is about to buy up eNom for $83 million. And God bless you if you use either of them for as a domain registrar. They are both a pain to deal with. GoDaddy and Namecheap are best in class for domain registrars. And it’s always a good idea to have a different company for your domain than for your hosting. If one gets hacked, the other doesn’t. Or if you need to move to another host quickly, having backups that you can restore, and a domain you can get to easily will let you do that. Having your email at a 3rd party like GSuites is required for that too. Read Get Your Email Off Your Host for more on why this is a good idea.